Roen Salvage Company is a marine contractor with over 66 years of experience throughout the Great Lakes and Midwestern inland waterways. We specialize in marine construction, corrosion protection, and navigational dredging. Our reputable track record of performing high-quality professional work and never leaving a single client unsatisfied is second to none. Some of our typical clients include the US Army Corps of Engineers, private commercial dock owners, the US Coast Guard, state and municipal governments. Roen Salvage Company was founded in 1949 by Charles W. Asher and Hilda Roen Asher with the assistance of Hilda's father Captain John Roen. Captain Roen was already known on the Great Lakes for his raising of the George M. Humphrey, (which he renamed Captain John Roen), a six hundred foot freighter that sank in the straits of Mackinaw in 1943. No other salvage company would accept the challenge. By September of 1944 Captain Roen had raised the giant; a feat everyone said was impossible. Roen Salvage is proud to continue this tradition of tenacity and hard work ethics that was started by Captain Roen. In 1959, Charles and Hilda Asher became sole owners, diversifying into heavy marine construction. In 1985, Charles' son, John Asher, was elected President and Charles, Chairman of the Board, a position he held until his death in 1993. John has maintained the same high ideals and integrity to the job as his father and grandfather. Roen Salvage Company has earned a reputation for its excellence in the field of marine construction. ​In 2015, John was appointed CEO, while promoting Thomas Drager to President and adding David Schanock as Vice President/CFO. The company is proud to list as very satisfied clients: the U.S. Army Corps of Engineers, the U.S. Coast Guard, many State and Municipal government agencies and Fortune 500 companies. The heart of what Captain Roen and Charles Asher started is evident today in the company's tradition and dedication to excellence on every project. 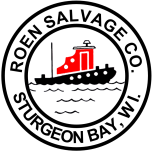 Roen Salvage is based in Sturgeon Bay, Wisconsin and performs marine construction work around the Great Lakes. The map to the right shows the locations of some of our completed projects. We mobilize our marine equipment by water to dredge shipping channels, build breakwaters, navigation lights, submarine pipelines, and steel sheet pile walls, for example. We mobilize our corrosion protection equipment by land and can repair and rehabilitate steel sheet pile dock walls anywhere in the United States. We have recently completed projects in places like Duluth, Chicago, Petoskey, Saginaw Bay, and Toledo.